Released in 1986 on Nia Records, You Gotta Come Out Fresh / Handling Things is the first record to feature Rockville Centre-born, N. Babylon-raised Freddie Foxxx aka Bumpy Knuckles, who was then known as Freddie C (short for his government name, Freddie Campbell). 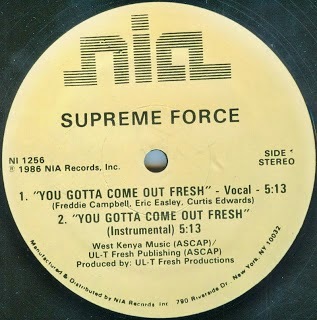 The Supreme Force trio consisted of Campbell rapping alongside MCs Cool C and Easy E (not to be confused with the Philadelphia and Compton rappers who rose to fame in the late '80s using these same names). 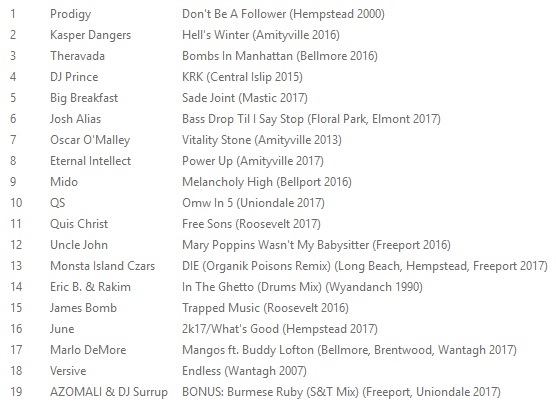 Check out the single below, download it with the instrumentals here, and as a special added bonus, enjoy this insane interview, in which Foxxx claims that he once beat Big Daddy Kane in a battle, that he was a more diverse MC than Rakim, and that he employs circular breathing. Props To The Break Of Dawn blog, from which I grabbed the single, and to whomever conducted the aforementioned interview in 2005 at Foxxx's space in Lobo Studios, Deer Park. Thanks for visiting and commenting. Honestly, I've never been the biggest fan of his, but he sounds great on this IMO.